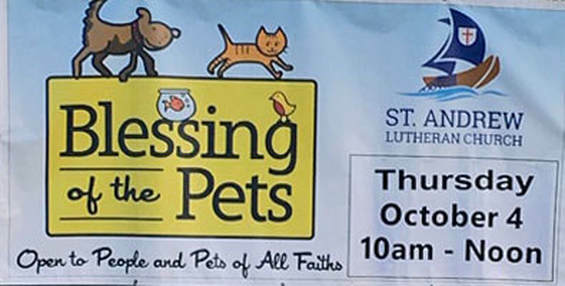 Pet Blessing Set for Thursday, 10 a.m.
Join the volunteers of Saint Andrew Lutheran Church, 8901 Del Webb Blvd., as they celebrate furry family members small and tall on Thursday, October 4, 10 a.m. to noon. The event takes place in the parking lot behind the church. This annual gathering is open to all faiths and has become quite a celebration of fun and friendship. There are only a few coveted spots left for this year’s eagerly anticipated Chili Challenge sponsored by the Residents’ Forum. This year, by popular demand, the Forum has opened up the challenge to all residents and clubs to do battle against Sun City’s Board of Directors and staff. If you think your chili has what it takes to be the best, come try to claim the trophy! Winners are decided by a vote by those in attendance. The Residents’ Forum Chili Challenge is set for Wednesday, October 10, 7 p.m., at Desert Vista. 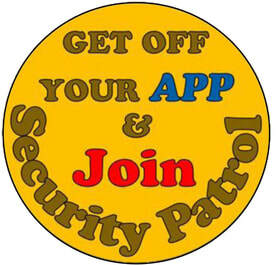 To register yourself or your club’s recipe, contact Julie Zerbel at 512-775-1309 or juliezerbel@yahoo.com. From left, Link Managing Editor Jeannette Carrillo, Advertising Coordinator Sharon Bishop and Committee Volunteer Bob Cohen. Photo by John Asay. The Link Magazine, Sun City Summerlin’s Official monthly notification to residents, took home third place for ad design in the 2018 Nevada Press Association’s Better Newspaper/Magazine Contest on Saturday at Palace Station. Link Managing Editor Jeannette Carrillo; Advertising Coordinator Sharon Bishop; and Link Committee Volunteer Bob Cohen attended the annual banquet, where 24 magazine awards were presented to publications in categories ranging from Best Feature Photo to Best Ad Series and Best Profile/Interview to Best Special Project. In all, more than 150 awards were presented for general excellence to publications throughout the state. Please note that the “Divas3” show is scheduled to take place Saturday, November 17, 7 p.m., at the Starbright Theatre. Page 41 of the October Link noted the wrong day of the week. The Link corrects mistakes. If you find an error in the magazine, bring it to the attention of Jeannette Carrillo, Link managing editor, at jeannettec@suncitylv.com. 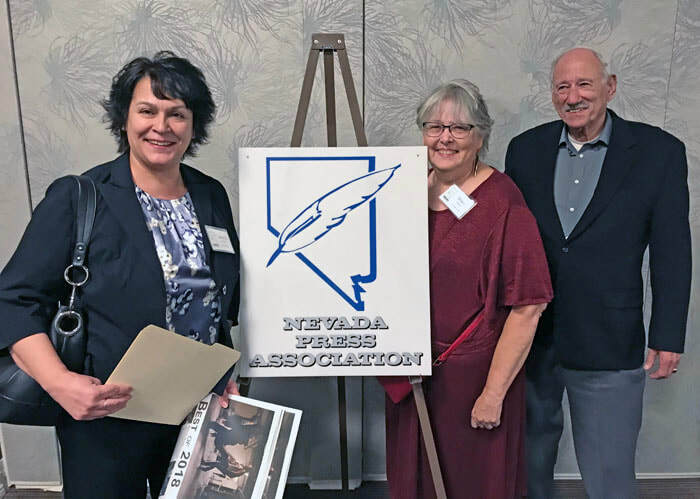 The Link's ad for The Summit's breakfast buffet took third place in the 2018 Nevada Press Association's Better Newspaper/Magazine Contest on Saturday.